Industrial Steel Portable Gantry Cranes are engineered for moving and positioning along the beam’s span. Heavy duty steel manufacturing will offer many years of service and makes for easy movement from one spot to another with four (4) 8″ glass filled swivel casters with four-position locks on the 500, 2,000 and 4,000 lb. capacity models, while utilizing phenolic casters on the 6,000 and 8,000 lb. capacity units and steel casters on the 10,000 lb capacity FHS and AHS models. More reasonably priced and versatile than permanent cranes. 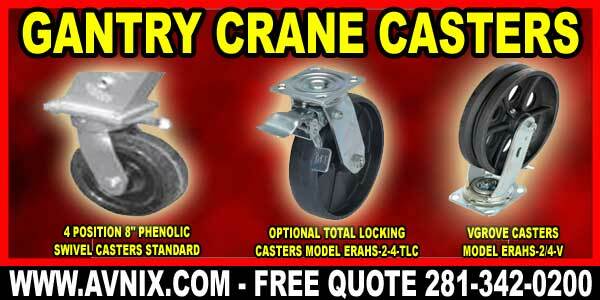 (4) 8″ Glass filled swivel casters with four-position locks on the 500, 2,000 and 4,000 lb. capacity models. (4) 8″ Phenolic casters on the 6,000 and 8,000 lb. capacity units and steel casters on the 10,000 lb capacity FHS and AHS models. Optional Lever Ratchet for easy one person height adjustment. blue finish with warning and operating stickers and complete owner’s manual. Our portable overhead gantry cranes are made to the highest standard achievable, and feature all the latest safety is engineered in their design as standard. The post and jib are made from high quality steel with cast bolts for extra strength. The whole gantry crane is powder coated for a more durable finish, and the crane can rotate a full 360 degrees with a touch, but is at all times under control. The base of the overhead gantry crane features standard size fork lift pockets, meaning that it will fit onto a regular fork lift for moving material around the warehouse or workplace to where it is needed, and set up merely requires the forks to be withdrawn. The gantry crane is basically ready for use as soon as hits the ground. Instead of having to move items around using the forklift or install a lifting system into the ceiling of your warehouse can be expensive, this portable jib crane is the perfect solution to your needs, and represents a good investment in getting the job completed more professionally at a comparatively low cost in contrast to the alternatives. 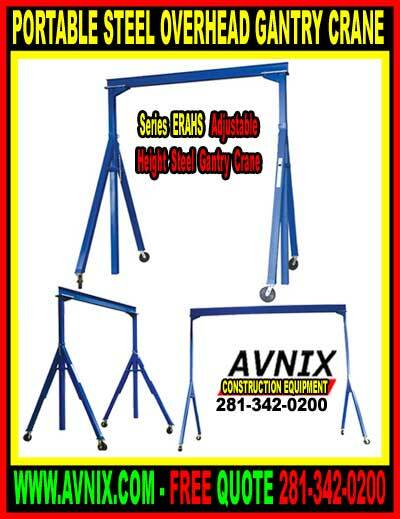 Avnix portable gantry cranes are easy to operate, simple to move, and reliable thanks to its uncomplicated design, these overhead gantry cranes have many uses and will be in constant demand.